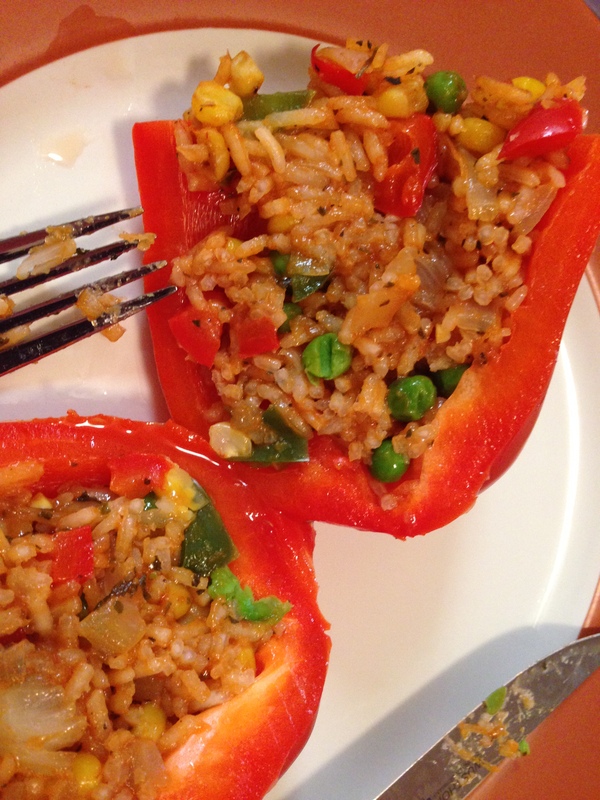 Stuffed peppers were one of the first things Adam and I made together. I found them in a cookbook my mom had given me: “3 in 1 Vegetarian Cookbook“. I had only “started liking” (a.k.a. tried) bell peppers a few months before this, so I had no idea what I was getting myself into! 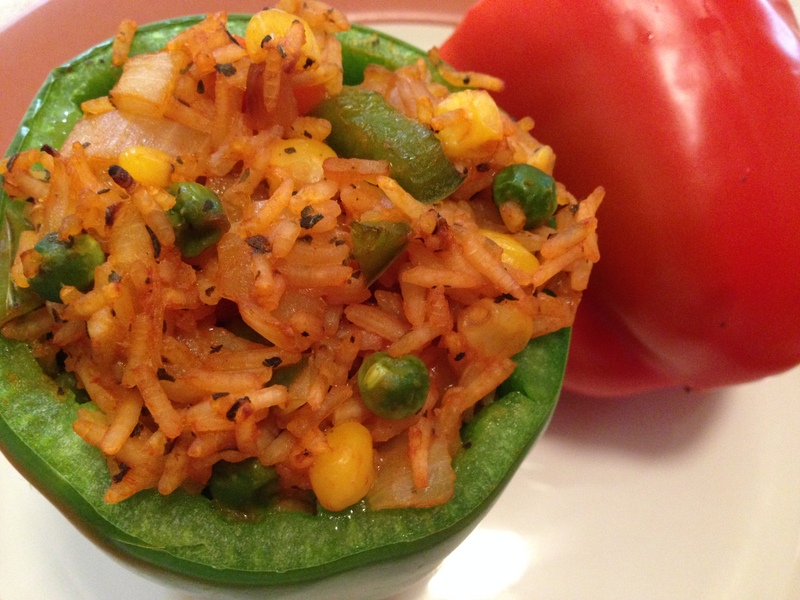 I decided that peppers couldn’t be very filling, so I made them as an appetizer and planned something else entirely for the main course. About 3 bites in, I realized I wouldn’t be eating much of that other dish I had cooked. While we were dating, this was our favorite meal to make together – the perfect vegetarian meal and the perfect meat-filled meal. Each time we make them, we do something a little different. 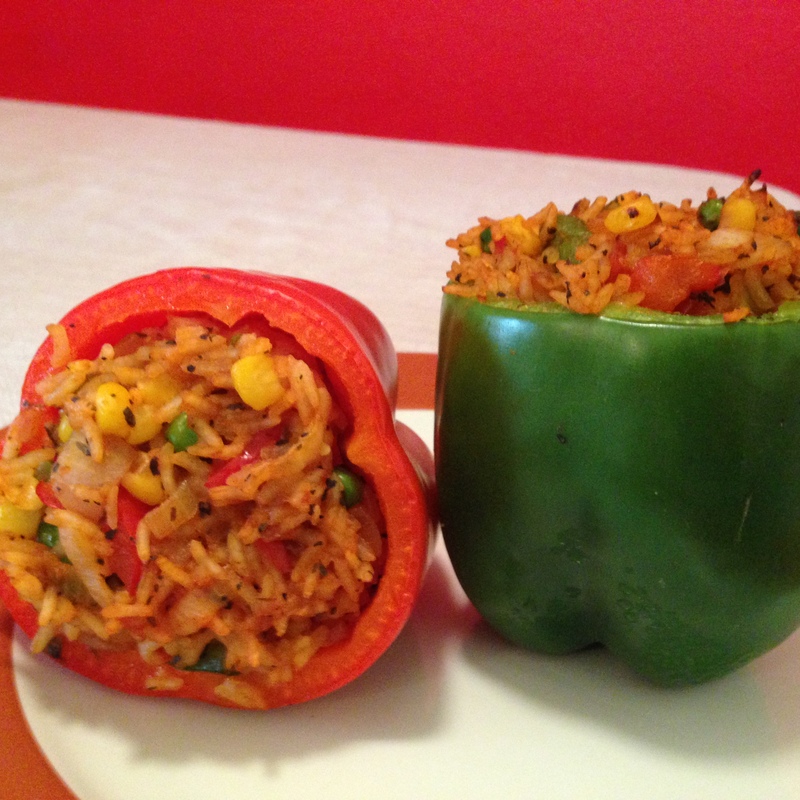 Who knows, maybe in 5 years, I will have completely different stuffed pepper recipe to share? Bring water to a boil, and cook rice according to directions on package. 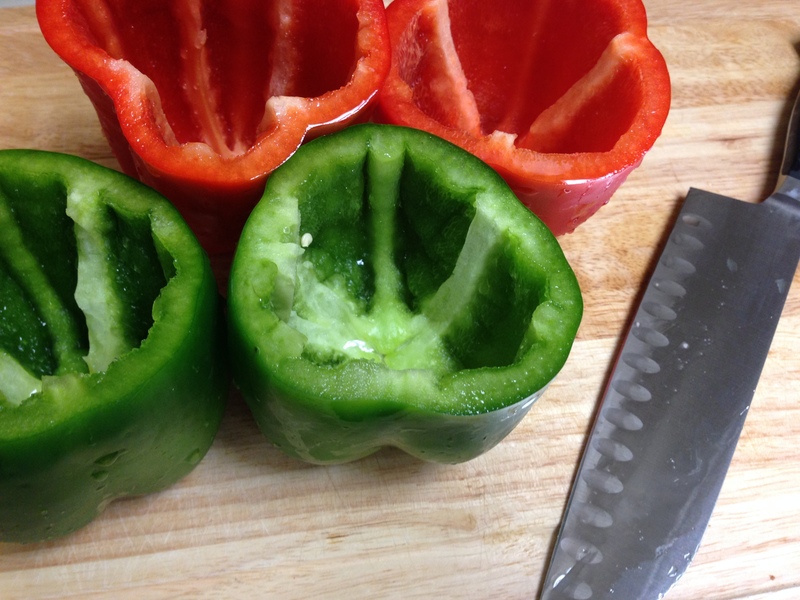 Preheat oven to 400 F.
Cut the tops off of 4 whole bell peppers and de-seed them. Don’t throw the tops out – we’ll use them later. Heat a large skillet and a large pan on medium heat. Cut all visible fat off the chicken and cut into small bite-size chunks. 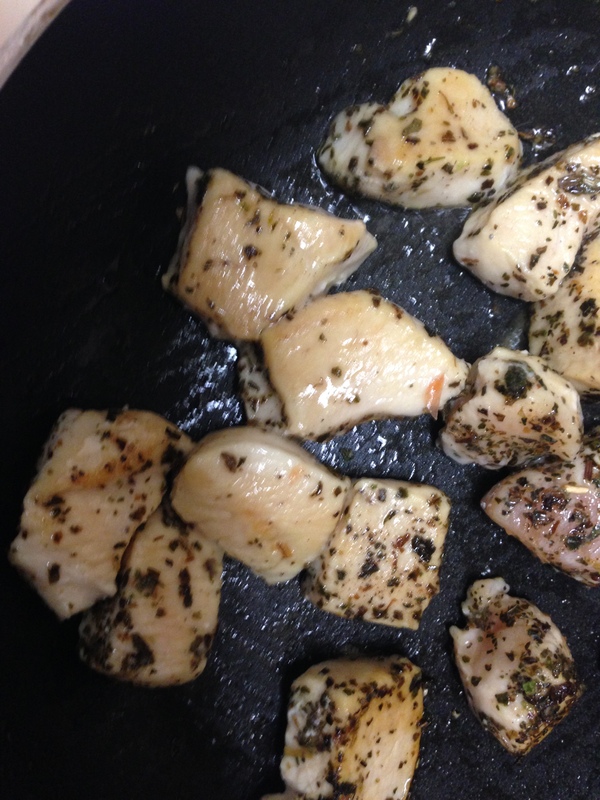 Cook with olive oil in the hot pan with 1/2 tsp basil, salt, and pepper. Set the pan aside once the chicken is cooked, about 8 minutes. Dice the onion. Mince garlic. Pour olive oil onto the hot skillet. Add onion and garlic. Cook for 5 minutes, or until onion becomes translucent. Dice all salvageable parts of the pepper tops. Add the diced peppers with 2 basil, salt, and pepper. Stir together and cook for 5 more minutes. 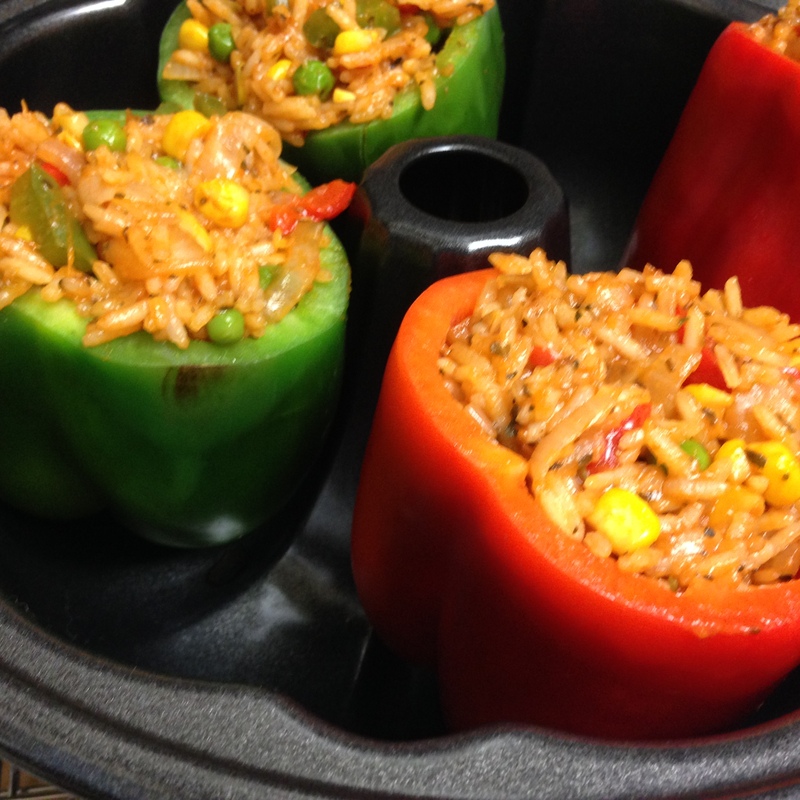 Wrap the whole peppers in aluminum foil and place them in a bundt pan or muffin tray, this will help stay upright while they cook. Put them in the oven for 8 minutes. 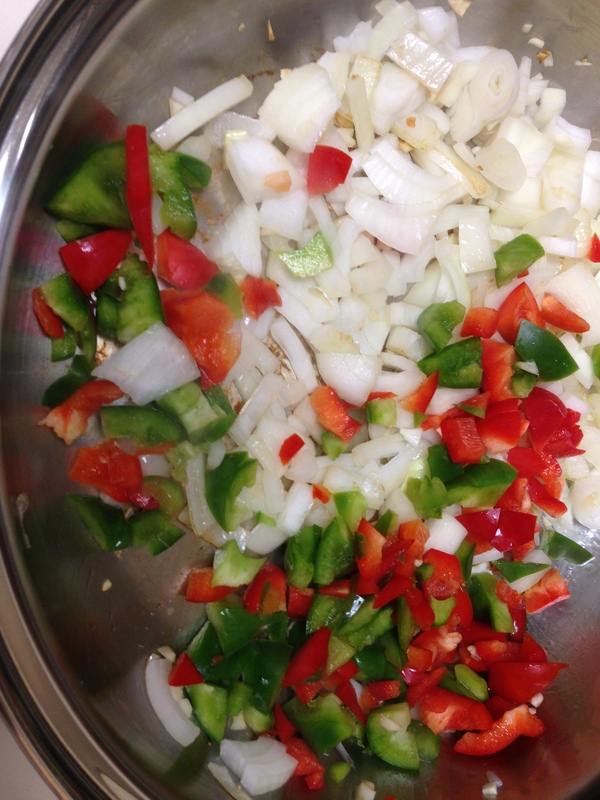 Mix the frozen vegetables into the onion and pepper mixture and continue to cook on low heat. 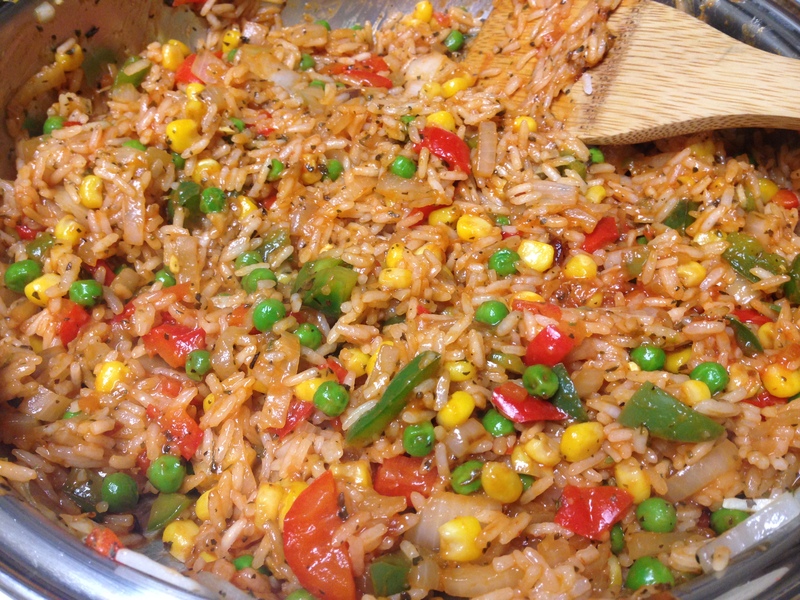 When the rice is cooked, mix it into the vegetables along with tomato sauce. 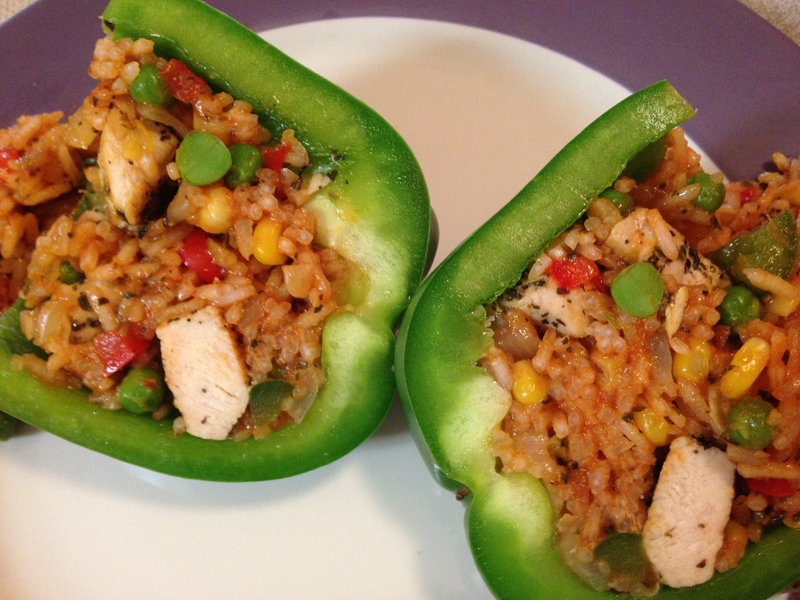 Once out of the oven, take the aluminum foil off the peppers and stuff with vegetable mixture, adding chicken if desired. Pour some hot water into the bottom of the bundt pan, so the bottom of the peppers don’t burn, and cook for another 8 minutes in the oven. If you really want roasted peppers, cook them for 20+ minutes. Let them cool for a few minutes before taking them out of the pan.